Faux leather can be a tricky trend, especially in the summer. I got these sassy little pants from H&M with the intention of wearing them out as club wear, but I wanted to know if they could be converted into a professionally stylish career outfit. Here’s what I managed to scrape together to create a frisky Friday feel that is office appropriate. 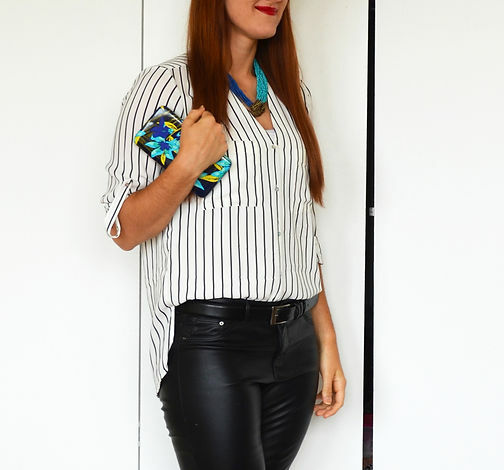 I paired the faux leather pants with a classic black and white striped blouse, also from H&M (similar one here). You don’t have to go all out Urkel on me, but never underestimate the power of properly tucking your tops to enhance your figure. Bonus tip! Vertical stripes tend to elongate the body, while horizontal stripes may cause the illusion that you are wider. 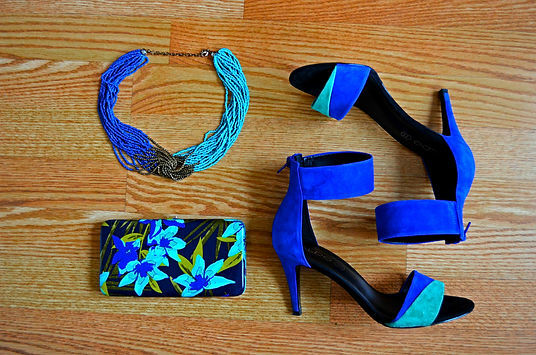 These fabulous cobalt and turquoise heels are from Aldo and I paired tem with a matching necklace andclutch that I stumbled upon at JCPenney. (Faux) leather pants automatically boost your overall confidence and transform even the gentlest dears into bonafide badass heartbreakers. I highly recommend owning at least one pair. I finished the look with a bold red lip using Revlon Colorburst in Romantic. You can find it at most drug stores. So what are your thoughts?! Would you rock this look around the office? Share in the comments below!